Clarity. It's imperative. If an idea makes sense to the author, translating that idea to their audience is the goal. When the plot is too dense and the language and lingo do not resonate, a show can implode faster than a star. 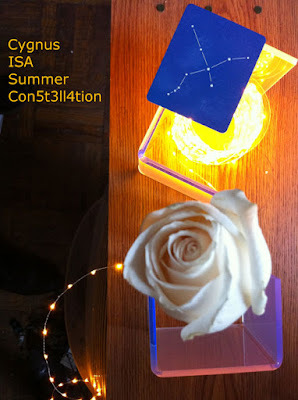 Such is the case in Cygnus ISA Summer Con5t3ll4tion. The story must have made complete sense to playwright Steven Mark Tenney but it did not translate on stage. Instead, a presentation of confusion was offered. Cygnus began as a piece of "Sci-fi noir" as Teich Lumen, a renegade of sorts, was introduced as the mouthpiece of the story and our eyes into the world. Regardless of terminology, the conviction was present and we were blasted off into this futuristic story of candles and telepathy and music box (sets) and Iceland. The correlation of all these things was clear to the characters but without a glossary or understanding of the world Cygnus created, what we were left with was an abundance of overlapping stories and rules of a world that could not be comprehended on first pass. The sci-fi noir element was genius. It was captivating and clever but when new narratives were introduced, new styles appeared. The lack of cohesion was disappointing. Through the noir device, Tenney offered elements of camp. The character of Silvie Moon and related plotline allowed the camp aura. But for the campiness to come through, the entirety of the company needed to sell it. This was far from the truth. Director Susan Tenney, who shared duties with her brother, seemed unsure of what direction to travel. And how to let us know exactly where in space and time we were. To give Tenney credit, he established rules and very rarely strayed from them, something some sci-fi writers tend not to do. With the plot going on so many tangents, the script exceeds a healthy sans intermission theatrical run time. Finding ways to chop parts down could be greatly beneficial as there are some momentum killing spots that run on and on. Cygnus was stylistically inconsistent from content to acting. And having an erratic ensemble is detrimental. There were some wonderful performers in the bunch though. As slightly bad boy Teich Luman, Andrew Bryce brought a Chris Pratt charm to the stage. His character choices were clear and concise, managing the noir monologues and dialogue with ease. Utility man Jake Ottosen was tremendous in his various parts and characterization. He knew the material and seemed the grasp the genre the best. It may be why he was on stage the longest as an assortment of characters. In this futuristic world, physicality played a key role for certain players. Rob Brinkman did an absolutely tremendous job in his static body movement. If you didn’t know any better, you would have believed he wasn’t human. Francesca Craft was equally strong in her physicality and vocal abilities as the Poetic Stewardess but lost her strength in her other roles. Like many others, Ivette Dumeng was a utility player. Dumeng found ways to discover intricacies in her multi-role track. From slightly nerdy to robotic, Dumeng sold it. Director Susan Tenney’s mission was to bring Cygnus to life in a cohesive and coherent manner. With material that struggled, Tenney had to rely to the visual appeal. By far the strongest aspect of this piece were the costumes. They were out of this world. Designer Janet Mervin did a sublime job mixing modern style with futuristic elements. The color pallet was consistent and her pieces worked for the actor. The use of textures and details were something extraordinary. You may take for granted the impact of texture but the way some of the material glistened and reflected under Joe Novak’s lights were stunning, evoking the feel of this piece. To create the multi-location though rarely specified set, plastic cubes were utilized. Visually, they were beneficial to Novak’s lighting looks, adding color when necessary. But the one aspect of the stage that harmed the show severely was the projection “screen”. The “screen” projected a loop of words, images, and themes that correlated to the show. It was dreadfully placed far downstage right, viewed cleanly by half the audience. It cut off a third of Tenney’s stage and caused issues when actors would walk in the line of projection, casting a sloppy shadow. The intent was to understand the piece. But it drew focus from the acting as you wanted to not only see what was on screen but if it had anything to do with what was playing on stage in that moment. Sadly, it didn’t. The loop would have been very beneficial during pre-show. The soundtrack by Topu Iyo and Mike Thies seemed intended for the noir style. At first it worked. Until it repeated and did not alter the mood of the scene as noir underscoring should. It was arbitrary rather than purposeful. Additionally, it would cut out at times which draws instant attention to the ear. Theatrical science fiction fantasy is hard. There's a reason why it's beloved on film when you have the magic of the movies. It's clear Cygnus is a project of passion. It's filled with creativity. It's meant for a certain audience. With some refining and trimming, the target demographic will eat it up. But this is not a piece for the general public. At least not right now.